I’ve been craving pancakes for the last couple weekends now. Problem was, I didn’t have any syrup. It kills me how expensive maple syrup is in Oklahoma (actually, I’m surprised I can even find it), so I’ve held out. I refuse to eat Aunt Jemimah’s and anyone (especially from New England) who eats that sludge is just crazy. Nick included. I finally couldn’t take it any longer. I needed pancakes. So when we went to Whole Foods in Tulsa this weekend, I shelled out $19.99 for some organic grade A amber. Love. Surprisingly, I haven’t met many pancakes I actually like. I’ve learned my lesson, so I rarely order pancakes at restaurants. When I do, I’m almost always disappointed. They’re usually dense, soggy, and require 12 glasses of water or OJ just to swallow them down. Mix the dry ingredients (except choco chips) in one bowl. 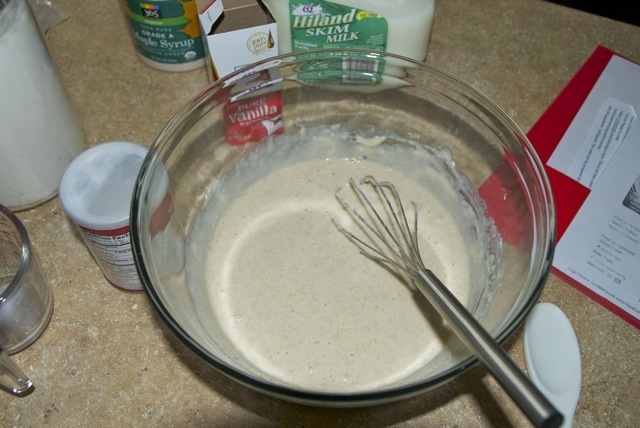 Mix the wet ingredients in another. 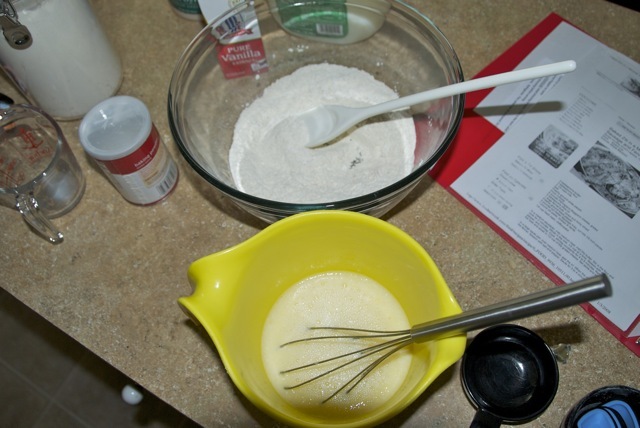 Whisk the wet into the dry, until all flour chunks are gone. 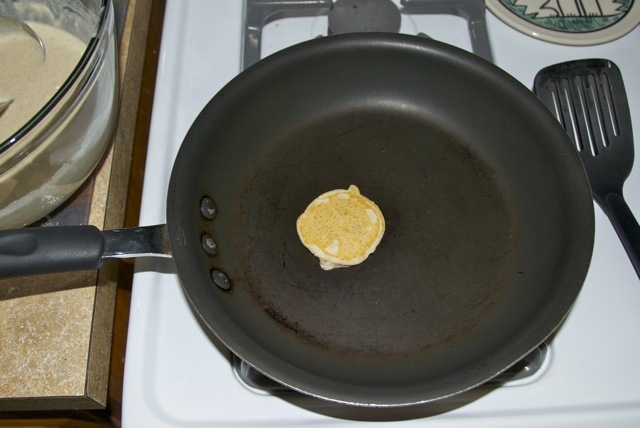 Pour a tiny bit of batter into the pan to make a mini pancake tester. 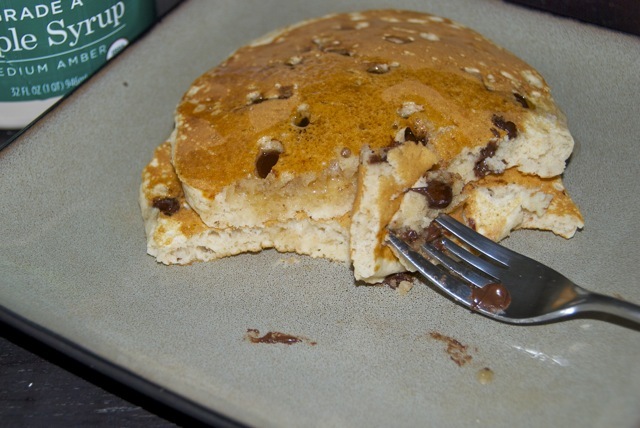 We used to fight over who got to eat the tester… the good thing about making the pancakes yourself: YOU get the tester! 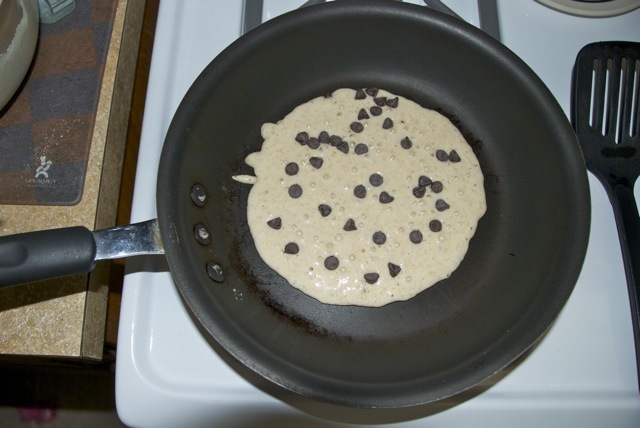 If all goes well with the tester, pour a big pancake and sprinkle with chocolate chips. 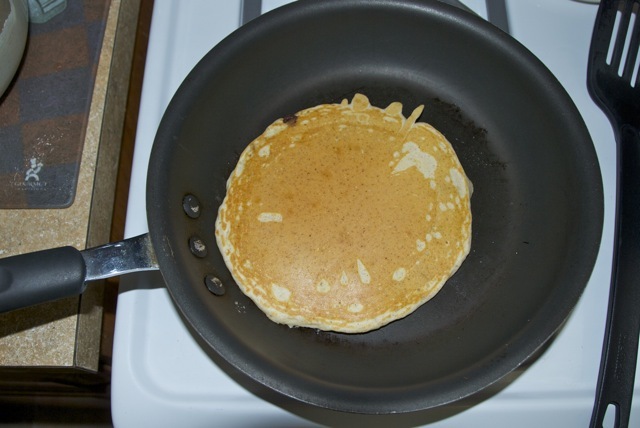 Once the pancake is nice and bubbly, peek underneath and see if it’s ready to flip! Perfect flip. 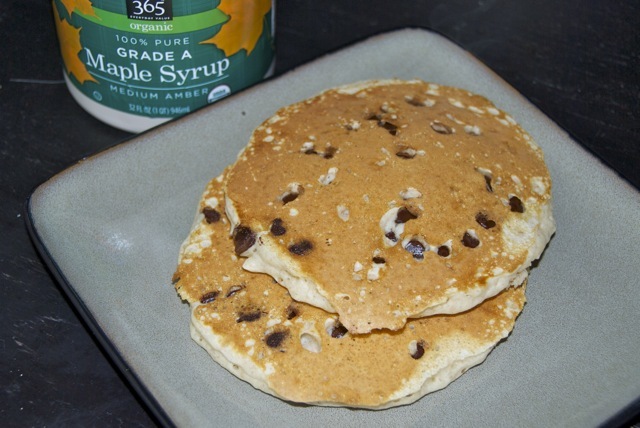 Serve the pancakes with lots of real maple syrup! 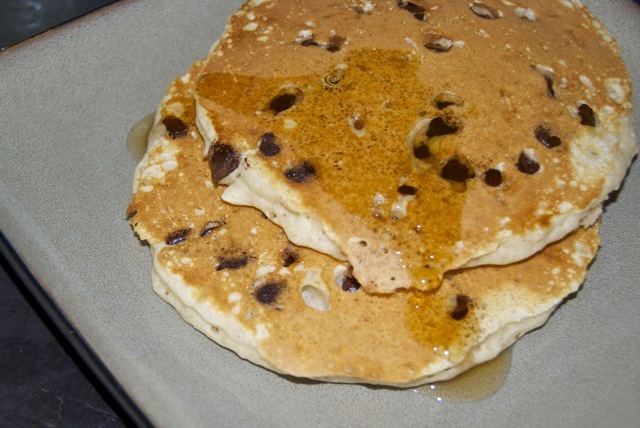 We didn’t always have chocolate chips as kids, but it’s an addition I really suggest you make. Who doesn’t like melty chocolate in their breakfast? My pancakes came out just as good as Dad’s, and Nick really liked them too. I had some leftover batter, so I made extra pancakes which we’ll throw in the toaster for an easy breakfast later in the week! Happy Shark Week! I miss Florida.